Aspire are a market leading vaping manufacturer when it comes to electronic cigarette kits – with their products being sold worldwide by the best vaping and e cig outlets. Aspire kits are known for innovation, safety and quality - not to mention their flavour and performance - and the company pride themselves on making sure every customer gets the perfect tools for vaping. What makes Aspire kits stand out? First established in 2013, Aspire have grown significantly in a relatively short amount of time. They are the brand responsible for adjustable airflow and sub-ohm vaping via a stock coil and have become pioneers within the vaping industry for their impressive hardware. • The Legendary Nautilus Mini. • First Sub Ohm for the mass market. Aspire firmly believes in listening to their customers. They strive to make customer experience as good as it can be and - as time goes by - each Aspire vape kit reflects the views of customers, boasting easier usability and a range of useful, innovative settings. With connections to designers and researchers overseas, Aspire continuously aim to improve their products and make themselves even more impressive market leaders. They have a remarkable quality control team and nothing is likely to slip through the cracks when it comes to safety. This is what makes this trustworthy brand so popular and why Aspire vape kits have stood the test of time. Cloudstix stock a huge range of genuine Aspire kits, from basic starter kits to advanced sub ohm kits. Everything from our Aspire PockeX to the Aspire Zelos Kit 2.0 is sure to impress and give you the edge when it comes to vaping or vape hardware supplies. We supply Aspire Kits Wholesale and Retail in the UK. We have been a trusted partner of Aspire Since 2016, but our business relationship extends much further back than this. Aspire are the brand we would always trust and recommend first to both end users and wholesale customers. Take a look at the kits below and read the descriptions carefully to make sure it is the right kit for you. Should you require any assistance then please do contact our team. Aspire Breeze 2 - Refillable Pod System The As.. Aspire Breeze 2 Special Edition - Refillable Pod S.. Your browser does not support HTML5 video. As.. Aspire K2 Quick Start Kit The Aspire K2 quick s.. Aspire K3 Quick Start Kit The Aspire K3 quick s.. Aspire PockeX UK AIO IN STOCK NOW Forget the.. ASPIRE REAX MINI KIT The Aspire Reax Mini Kit c.. 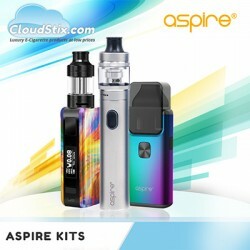 Aspire SkyStar Revvo Kit Aspire brings you.. Aspire Speeder Kit Aspire are proud to introduc.. Aspire Tigon Kit - Cloudstix UK IN STOCK NOW ..